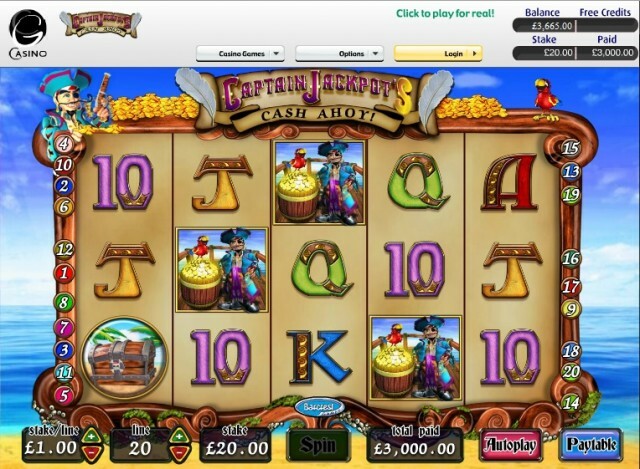 Captain Jackpots is the latest Barcrest fruit machine to be released as an online slot at Sky Vegas. Following the success of fruit machine titles such as Rainbow Riches and Cashino, Barcrest have released Captain Jackpots as an online slot. Captain Jackpots Treasure Troves was originally released as a Category C £70 jackpot fruit machine is a variety of clubs and outlets. Captain Treasure quickly became popular thanks to it’s community bonus game feature, and it didn’t take long for Barcrest to decide to release the title as an online fruit machine. Sky Vegas have secured the rights for exclusivity of Captain Jackpots, and are the only online casino to currently offer this fruit machine. Captain Jackpots is a 5 reel, 20 payline slot. As you’d expect from a Barcrest fruit machine, the game play is rich, and the graphics stunning. Captain Jackpots has 3 bonus round features that will keep you entertained for hours, and offer great additional winning opportunities. First up is the Treasure chest bonus, activated by matching 3 or more treasure chest symbols anywhere on the reels and offers players the chance to win up to 500x their stake. The Captain Jackpot bonus is our favourite bonus feature, triggered when you get 3 Captain Jackpot symbols on the middle 3 reels. This is the hardest bonus feature to trigger but the rewards are great – players must stop gold, silver and bronze pots on the reels to redeem that prize. Check out the other Barcrest fruit machines available to play online here. Last but not least is the Pirate ship bonus which activates when the pirate ship appears anywhere on the reels. The Pirate Ship bonus offers players the opportunity to win up to 500x their stake as you choose from a host of ships to reveal cash multipliers. Captain Jackpots is exclusive to Sky Vegas casino. We highly recommend Sky Vegas and love their range of UK style fruit machines and Barcrest slots. Get up to £150 bonus when you play – Play at Sky Vegas.